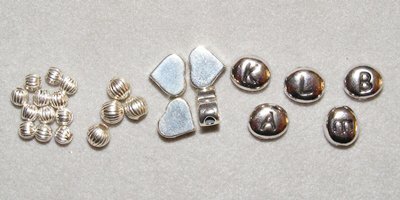 Keepsake Baby Jewelry, DIY Beading Instructions! Use step-by-step illustrated beading instructions to make beaded baby name bracelets for your little ones! If you are interested in making keepsake jewelry for yourself check out Wanda's Mama Jewelry tutorial! This tutorial assumes that you are new to beading. The beading technique used is called bead stringing. It's an easy, beginner technique. These beading instructions are very step by step. Each step is complete with pictures and detailed instructions. Selecting Your Beads...Select beads labeled "lead free". 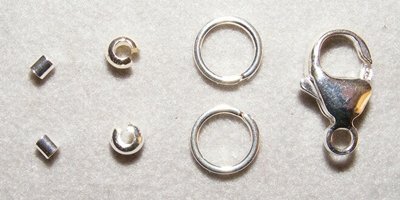 Lead in jewelry can be harmful to babies and small children. So, no crystals. Beads made of lead free pewter, sterling silver, gold or pearls are good choices. Choose these metals and organic material for keepsake baby jewelry that lasts a lifetime. 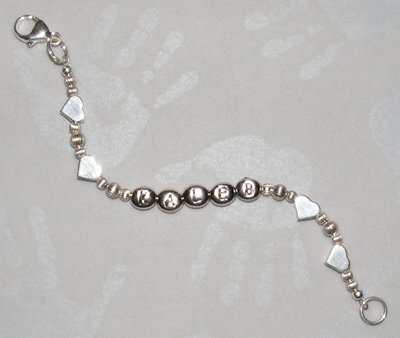 Baby Jewelry Sizes...Bracelet sizes for newborns to twenty four months can range from 3.5" - 5.5" (8.9 - 14 cm) respectively. To adjust the size, simply add or remove a few beads and check the fit on your little one's wrist. Once you've bought and gathered your supplies and materials, you'll need about 45 minutes to one hour to complete this baby jewelry making project. 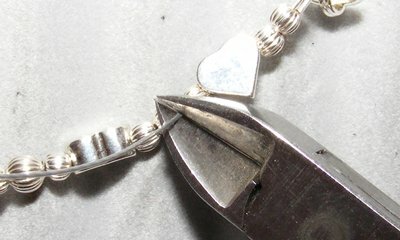 Here's more information on how to use jewelry pliers and what beading tasks they are used to accomplish. A beading board helps you to layout a pattern without the beads rolling around and to measure the length of the bracelet. 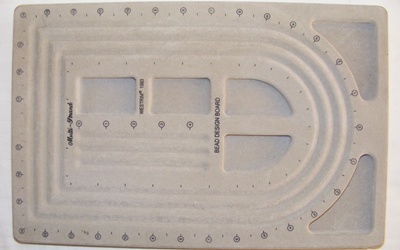 The numbers along the side are one inch marks. On the beading board, starting at the '0' mark, place the center letter of the name or word you want to spell. On both sides of the last letter bead, layout the beads in this pattern twice: 3mm bead, 4mm bead, 6mm bead. Now, place two 3mm beads on each end of the pattern. 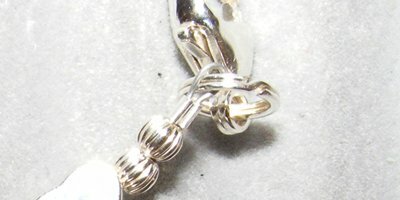 This pattern will yield a bracelet that is 4.5" (11.4 cm) without the clasp. 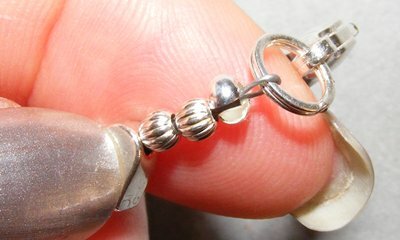 The clasp (two split rings and a lobster claw clasp) is about 1" (2.5 cm). 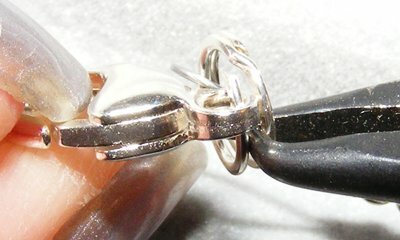 The finished length of the bracelet is about 5.5" (14 cm). 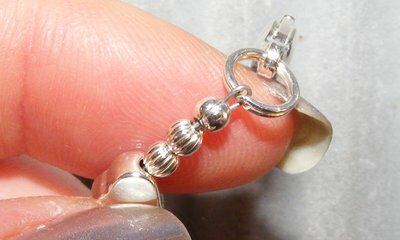 Ways to adjust the length: (1) Use smaller beads, split rings and clasp or (2) Use fewer beads. 3. Make a bead stopper and string the beads. 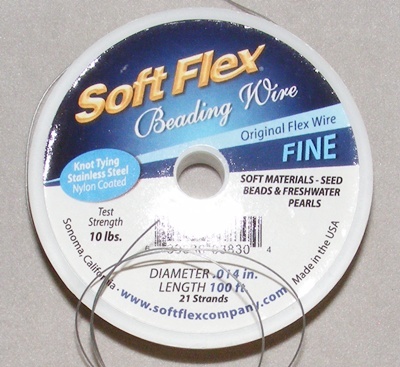 String, or thread, all the beads onto the flexible beading wire. 4. After stringing all of the beads, check to ensure that you have strung the bead pattern as you want it. Make any necessary adjustments now. 5. 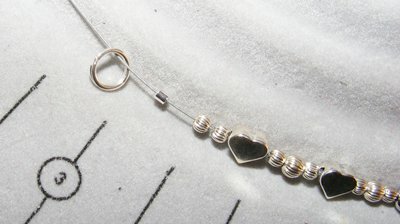 On one end of the strand of beads, string a crimp bead and one split ring onto the flexible beading wire. 6. Pass the beading wire back through the crimp bead and a few other beads. Repeat the Steps 5 and 6 for the second wire end. 7. 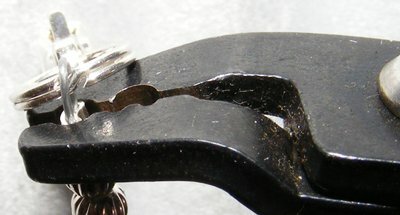 On one of the split rings, using the split ring pliers (or your fingers), open a split spring and slide the lobster claw clasp into it. 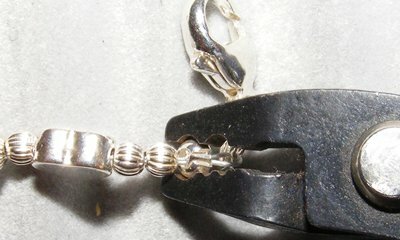 Slide the lobster claw clasp onto the split ring until the split ring is closed and the clasp is secure. 8. 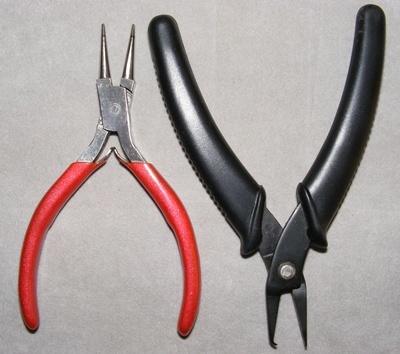 With the round nose pliers in your dominant hand, place the tip of the round nose pliers between the split ring and the crimp tube bead. (For greater leverage, rest the tip of the pliers on your work surface.) 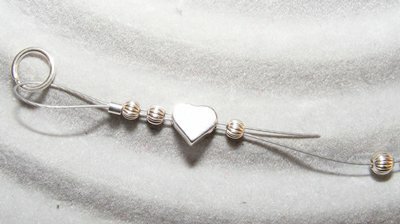 Using your index finger and thumb of your non-dominant hand, pull on the end of the flexible beading wire to draw the beads next to the clasp. Repeat the process on the other end. Before you secure the clasp, let's check the fit of the bracelet. Gently pick up the bracelet and clasp it around your baby's wrist. Is it too loose or too tight? If the length is not as you'd like it to be, simply undo the ends, add or remove beads. When you're satisfied with the fit, move onto the next step. 10. 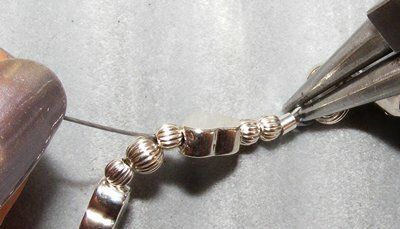 Crimp both bracelet ends. 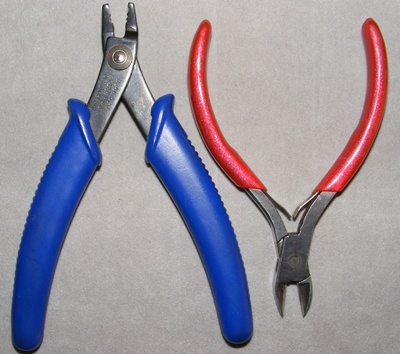 With your dominant hand, pick up the crimping pliers. 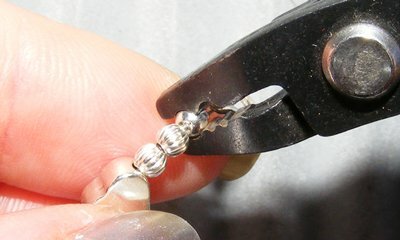 Place the crimp bead into the notch closest to the pliers' handle. Try to ensure that the wires are separated and parallel, with one wire on each side of the notch. 11. Place the crimped crimp bead into the notch closest to the crimping pliers' tip. Squeeze the pliers shut to fold the crimp bead. 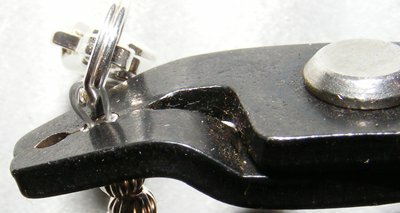 Folded crimp bead with attached clasp. 12. Trim the excess wire from both bracelet ends. This step is optional, but gives your keepsake baby jewelry a more finished look. Place the folded crimp bead into the crimp cover. 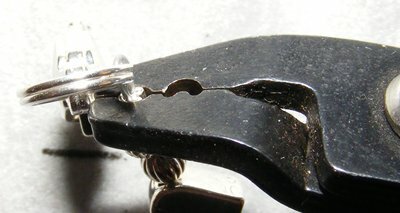 Place the crimp covered bead into the notch closest to the crimping pliers' tip. Enjoy your baby keepsake jewelry! 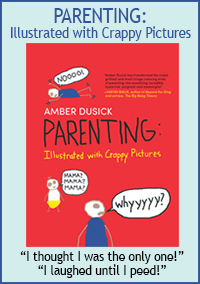 Your little one will grow to appreciate that you made it! Tutorial created by Wanda A. Epps. Visit her at Making-Beaded-Jewelry.com to find out about where and how to buy beading supplies, and how to make more beaded jewelry. Return to the Baby Clothes & Accessories section for more project ideas!